You can use the import utility to integrate scenes into a Harmony environment. In the Package Directory section, click on the browse button at the end of the field to search for a Harmony scene to import. Any supported Harmony file can be imported, including IEContents.dat files. 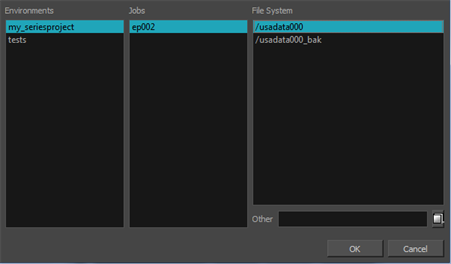 The IEContents.dat file includes database and scene file information. IEContents.dat files are created when you DO NOT check the Export to Offline option in the Export Scene(s) dialog box in Control Center. In the Destination section, click the browse button to open the File System Selector window. 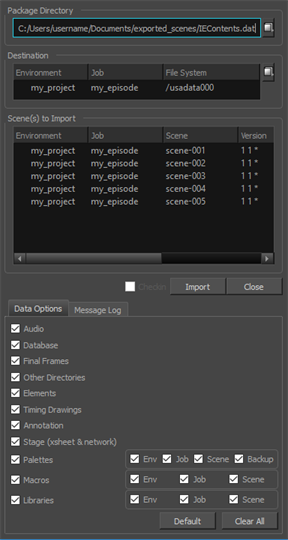 Select the environment, job and file system for where you want to place the imported scene. In the Scene(s) to Import section, select the scenes you would like to import. If no scenes are selected, all the scenes will be imported. Check the Check In option (beside the Import button), if your scene was checked out during export. If your scene was not checked out, this option remains disabled. If the scene already exists, the Scene Exists dialog box appears. Decide if you want to import or skip importing your first selected scene. The Import All Scenes option will import all selected scenes.